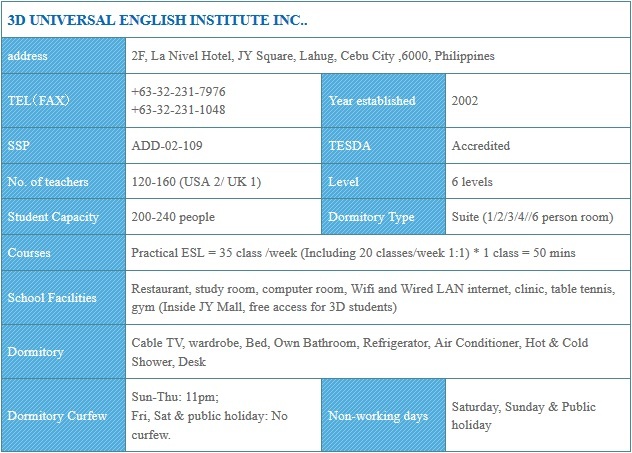 3D English+Gym Course（4 ESL 1：1 + 1 group class ＋2 gym training classes） Want to come to Cebu to study English while building up your muscles? Or perhaps getting into a better shape? Our English+Gym Course features 2 gym classes with personal trainer per day. Most importantly, it features at least 4 classes of 1:1 (man-to-man/private tuition) class every day, which gives students numerous opportunity to speak English in the class.